This wacky, zany parade attracts thousands of people every year… there are fantastically created floats, giant puppets, amazing costumes. Every summer, a different theme is announced and participants are invited to create something based on whatever the theme happens to be. 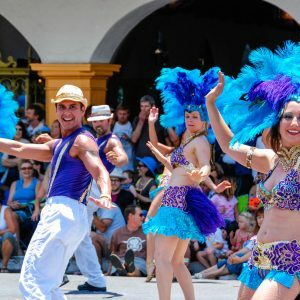 With over 1000 participants, the parade starts on lower State Street and ends up in Alameda Park for a big party with live music and dancing, food and drinks, and arts and crafts. 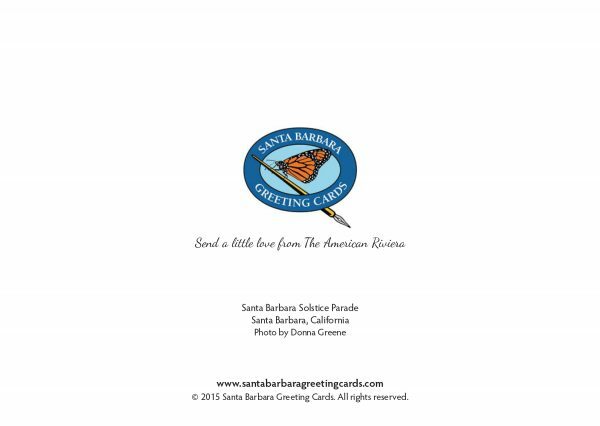 Santa Barbara Greeting Cards have a beautiful, glossy finish, are blank on the inside, measure 5×7 inches and come with white envelopes. 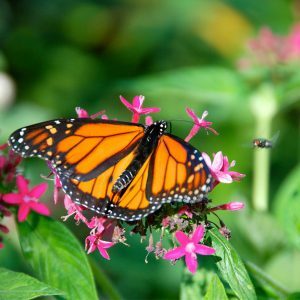 Investigate all there is to do at the Santa Barbara Museum of Natural History. 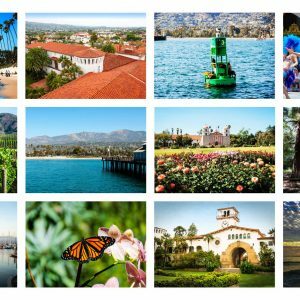 The Quintessential Santa Barbara greeting card set gives you a taste of some of the highlights of Santa Barbara. 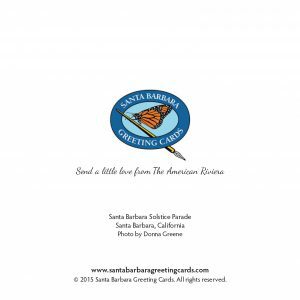 Twelve different cards with envelopes come in a beautiful tin printed with scenes of Santa Barbara… plus a bamboo pen to get you started as soon as you open the box. 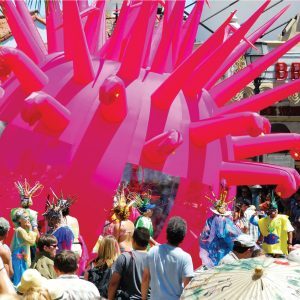 The wildly popular and wacky home-grown Santa Barbara Summer Solstice Parade is one of Santa Barbara’s best happenings. Always a favorite! 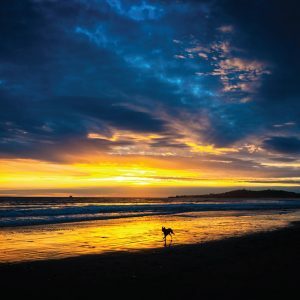 One of many Santa Barbara legendary sunsets. 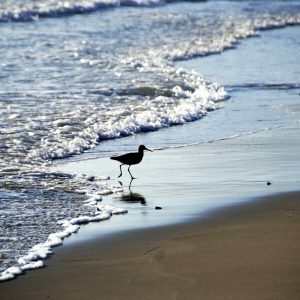 A typical Santa Barbara beach scene. 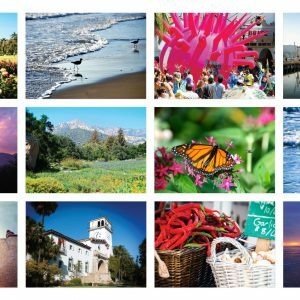 The American Riviera postcard set gives you a beautiful sampling of views of Santa Barbara. Twelve different postcards come in a beautiful tin printed with scenes of Santa Barbara… plus a bamboo pen to get you started as soon as you open the box. 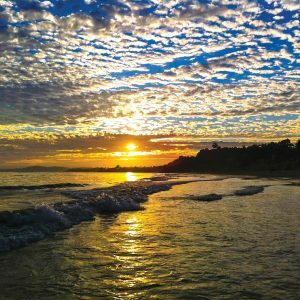 Santa Barbara is home to some dramatic sunsets. 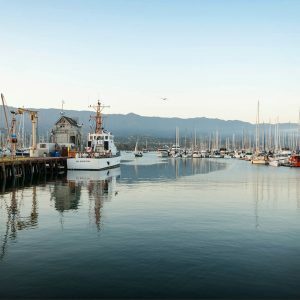 There's always a lot going on at the Santa Barbara Harbor, especially as the fishing boats are coming in and people are out for a stroll or getting dinner.